Private Transfers can pick you up from anywhere at a time you specify. Pick ups include one hour of waiting time and if you wish to stop on your journey for lunch, shopping or other reason you may do so. There is a maximum capacity of 10 people per minibus for reasons of comfort. If your group is larger than 10 people a 25 passenger bus can be arranged. All minibuses are late model (2002 and above) Toyota, Nissan or Hyundai vehicles which meet and exceed safety regulations and must pass a transportation safety board inspection twice a year. Drivers have a minimum of 2 years experience in tourist transportation and have passed all the Costa Rican Bureau of Transportation's safety and public relations courses required by law. Shuttle transportation is a cheaper alternative to a private transfer as it is a shared transportation. Shuttles pick up at specific times in the day from most major hotels, either once or twice daily. On most routes there is usually a 15 minute to 30 minute break. Rates on shuttles are per person and if you are a larger group you will often be better off with a private transfer. For one or two people traveling a shuttle transfer will usually be your best option. Shuttle usually have a longer driving time than private transfers as other people have to be picked up and dropped off and there is often a break mid journey. Our vehicles are fully insured and comply with all safety regulations. Maintenance is very important to us because it means safety and comfort for you. We do our best to hire experienced drivers who know the roads you'll be traveling on and will get you to your destination in a timely but safely manner.. Private shuttles will pick up anywhere that you request, including the San Jose International Airport and include one hour of waiting time. They can also take you anywhere that you require. Shared shuttles pick up from most major hotels. They DO NOT pick up from the airport. Shuttles operate fixed routes. This is the northernmost beach in Costa Rica. It's surrounded by the National Parks of Santa Rosa to the South and Guanacaste to the East. This is a place to visit if you want to get away from it all as it is remote and tranquil. Excellent for windsurfing and. kiteboarding as the wind blows strong all year and particularly between December to March. Also for visits to Bolaños Island which is a Natural Refuge where there are several bird colonies. Not the place to go if you're looking for an active nightlife, but there's lots to do activity-wise. Probably suitable for families with young children, couples, windsurfing, kiteboarding or fishing enthusiasts. Liberia Costa Rica Airport shuttles and private airport transfers will meet you directly at the airport when your flight arrives. The rates quoted include free waiting time in case your flight is delayed. If your flight into Liberia Airport is cancelled we will automatically cancel your transportation and will re-book you at no extra cost when you send us your new flight information. San Jose Airport transportation and private airport transfers will meet you directly at the airport when your flight arrives. The rate quoted will include free waiting time in case your flight is delayed. If your flight into SJO Airport is cancelled we will automatically cancel your transportation and will re-book you at no extra cost when you send us your new flight information. To request a quote please send us your information using the form below. If you have flight arrival and departure information, please include it. We will then send you a quote with instructions on how to finalize your reservation and where to meet your driver at the airport. We are also happy to answer any questions you have about your trip. Private transfers willl meet you at the arrivals gate of the Liberia or San Jose Costa Rica Airport, your hotel or any other location in Costa Rica at the time you specify. Your driver will wait for you outside of customs with a sign with your name on it. We also provide you with our direct contact information should you need to contact us for any reason. Shared shuttles or airport taxis might be more difficult to locate than our private drivers. Our private transfers offer you the convenience and efficiency you need to enjoy your Costa Rica vacation. Liberia Airport private transfers will meet you directly at the airport when your flight arrives. The rates quoted include free waiting time in case your flight is delayed. If your flight into Liberia Airport is cancelled we will automatically cancel your transportation and will re-book you at no extra cost when you send us your new flight information. Shared shuttle transportation is a lower cost alternative to a private transfer. Shuttles pick up at specific times in the day, usually either once or twice daily. Rates are per person. Shuttles are lower in cost but take a bit longer than private transfers. We recommend private transfers for convenience, efficiency and personazlied service. If your destination is not listed or if you need additional transportation services please contact us for more information and a quote. Driving time from Liberia Airport to Tamarindo is approximately 1 hour. Distance from Liberia Airport to Tamarindo is about 80 km. For private transportation to or from Tamarindo contact us for a quote. Shuttle transfers leave Liberia Airport for Tamarindo after each flight. Shuttle transfers depart Tamarindo at time of your choice. Driving time from Liberia Airport to JW Marriott is 1 hour and 45 minutes. Distance from Liberia Airport to JW Marriott is about 99 km. For private transportation to or from the JW Marriott contact us for a quote. Driving time from Liberia Airport to Papagayo is 45 minutes to 1 hour depending on which beach. Distance from Liberia to Playa del Coco for example is about 60 km. For private transportation to or from the Papagayo area contact us for a quote. Shuttle time is 45 minutes to 1 hour. Driving time from Liberia Airport to Monteverde is 3 hours.The distance between Liberia Airport and Monteverde is about 100 km. For private transportation between Liberia Airport and Monteverde please contact us for a quote. Shuttle transport leaves Liberia for Monteverde at 3.15 pm. Shuttle transport leaves Monteverde for Liberia at 9.45 am. Shuttle time is 3 hours 30 minutes. Driving time from Liberia Airport to Flamingo is 1 hour. Distance from Liberia Airport to Flamingo is about 85 km. For private transportation to or from the Flamingo area contact us for a quote. Shuttle transfers leave Liberia Airport for Flamingo, Conchal and Potrero at 12:30 pm, 2.30 pm and 8.00 pm. Shuttle transfers leave Flamingo, Conchal and Potrero at 7 am and 1.30 pm. Shuttle time is 1 hour 15 minutes. Driving time from Liberia Airport to Manuel Antonio is about 4 hours. Distance from Liberia Airport to Manuel Antonio is 260km. Shuttle transport leaves Liberia Airport for Manuel Antonio at 9 am. Shuttle transportation leaves Manuel Antonio for Liberia Airport at 7am. Shuttle time is 5 hours 15 minutes. Driving time from Liberia Airport to Puntarenas is about 1 hour 45 minutes. Distance from Liberia to Puntarenas is 130 km. For private transportation between Liberia Airport and Puntarenas please contact us for a quote. Shuttle transport leaves Liberia Airport for Puntarenas at 9 am. Shuttle transportation leaves Puntarenas for Liberia at 9.15 am. Shuttle time is 3 hours 15 minutes. Driving time from Liberia Airport to Jaco is about 3 hours. Distance from Liberia to Jaco is 190 km. For private transportation between Liberia Airport and Jaco please contact us for a quote. Shuttle transportation leaves Jaco for Liberia at 8.30 am. Shuttle time is 4 hours 15 minutes. Driving time from Liberia Airport to Rincon de la Viejas is about 45 minutes. Distance from Liberia to Rincon de la Viejas is about 30 km. For private transportation between Liberia Airport and Rincon de la Vieja please contact us for a quote. Shuttle transportation leaves Liberia for Rincon de Vieja at 12 pm, 1.15 pm and 3.15 pm. Shuttle transfers leave Rincon de la Vieja for Liberia at 7.15 am, 11 am and 2.15 pm. Shuttle time is 1 hour. For private transportation between Liberia and San Jose please contact us for a quote. Shuttle transportation leaves Liberia for San Jose at 8.15 am and 3.15 pm. Shuttle transfers leave San Jose for Liberia at 7.45 am and 2.15 pm. For private transportation between Liberia and anywhere in the South Nicoya please contact us for a quote. Shuttle transfer leaves Santa Teresa and Malpais at 8.15 am, Montezuma at 8.30 am and Tambor at 9.25 am for Liberia. Shuttle time is 5 hours. Shuttle transfers leave Liberia Airport for other routes after each flight. Shuttle transfers depart at time of your choice. Shuttle transfers leave San Jose Airport for Tamarindo after each flight. Driving time from San Jose to JW Marriott is about 4 hours. Distance from San Jose to Tamarindo is 280km. Driving time from San Jose to Papagayo is about 4 hours 45 minutes Distance from San Jose to Papagayo is 280 km. The Gulf of Papagayo includes: four seasons, exclusive Resort, Andaz papagayo And Allegro Papagayo. Shuttle time is 4.45 to 5.30 hours. Driving time from San Jose Airport to Manuel Antonio is about 3 hours. Distance from Liberia Airport to Manuel Antonio is 185 km. Shuttle transport leaves San Jose Airport for Manuel Antonio at 9 am. Shuttle transportation leaves Manuel Antonio for San Jose Airport at 7am. Shuttle transfers leave San jose Airport for other routes after each flight. While Spam filters enable us to keep out the "riff raff," unfortunately they can sometimes keep you from receiving mail from email addresses that are legitimately trying to reach you. Many of the Spam filters used by your internet service providers restrict not just the emails you don't want, but also the ones you're looking for. You should expect an email response from us within 24 hours, although our average response time is less than 2 hours. Liberia, as yet, retains its essentially Tico flavor, tourists are still regarded with curious interest if seen walking down the street and you certainly won’t find yourself hassled by pushy salesmen here which is somewhat of a relief for those who have been visiting the heavily tourist populated towns such as Monteverde and Arenal and beaches like Tamarindo. If you want to experience a living Costa Rican town at work then Liberia is the place to go. It is much smaller and less chaotic than San Jose and you can still see remnants of its colonial era. It is known as the ‘Ciudad Blanca’ (White City) due to the white 'bahareque' houses, a material made of straw and cattle dung, similar to adobe. One of the best things to do in Liberia is simply take a stroll along the streets and see where you end up, that’s if you have a good sense of direction of course. But you should always try and make it back to the Plaza Central at dusk to listen to the gossip of the local birds (zanates), the winged variety that is. However, do keep an eye skyward, otherwise you may find yourself returning to your hotel room with an addition to your outfit. On the bright side, apparently this is supposed to bring you good luck if it lands on your head! The oldest church in Liberia is locally called La Agonia and is at the far end of Avenida Central. (See Maps). Behind which on a clear day you can see the distant Volcan Miravalles and no, the Hotel Daisyta can not be found within the sanctuary of the church as it appears to be signposted. There are also several other older buildings along this street leading from the Plaza Central to La Agonia La Gobernacion building. If you wander near the outskirts of town you may be lucky enough to see howler monkeys , known as ‘congos’ cruising around the tree tops. Around around town you will find many Guanacaste trees, the national tree of Costa Rica, along with their unusual ear-shaped seed pods, known locally as ‘Orejas’ (ears). Not to be confused with the large, circular sweet snack of the same name often found hanging in market stalls. Break one open (the seed pod) and give it a sniff, it has a unique smell, rather akin to cat’s urine or something of that nature. Liberia’s block system is mostly one way, apart from the Avenida 25 Julio which becomes the Avenida Central, so if you are driving yourself double check which way traffic is going as signs are not always obvious and make sure you watch out for the stop ‘Alto’ signs. Even locals get it wrong sometimes so don’t be too embarrassed if you do! Accidents like elsewhere in Costa Rica are very common here. As a pedestrian, still look both ways when crossing the street even if you think you’ve got the traffic direction down pat, as the one-way rule does not seem to apply to cyclists or else is just blissfully ignored. Bearing in mind that a bike doesn’t make any noise, you won’t have heard it coming when you suddenly find yourself making sudden acquaintance with said bike and irate cyclist. Anyway that said, we hope that you enjoy an accident free stay in Liberia. Liberia as yet, retains its essentially Tico flavor, tourists are still regarded with curious interest if seen walking down the street and you certainly won’t find yourself hassled by pushy salesmen here which is somewhat of a relief for those who have been visiting the heavily tourist populated towns such as Monteverde and Arenal and beaches like Tamarindo. The town is laid out in the standard block system and is centered around the Plaza Central with its modern church (Iglesia Inmaculada Concepcion de Maria) as the main centerpiece. The clock tower, completely separate from the rest of the church, is an interesting architectural feature, although don’t rely on its timekeeping as the hands rarely move! The oldest church in Liberia is locally called La Agoniaand is at the far end of Avenida Central. (see map). Behind which on a clear day you can see the distant Volcan Miravalles. There are also several other older buildings along this street leading from the Plaza Central to La Agonia, including the La Gobernacion building. If you wander near the outskirts of town you may be lucky enough to see howler monkeys, known as ‘congos’ cruising around the tree tops. Also around town you will find many Guanacaste trees, the national tree of Costa Rica, along with their unusual ear-shaped seed pods, known locally as ‘Orejas’ (ears). Not to be confused with the large, circular sweet snack of the same name often found hanging in market stalls. Break one open (the seed pod) and give it a sniff, it has a unique smell, rather akin to cat’s urine or something of that nature. A flight to Liberia Costa Rica Airport will leave you just a short ride away from some of Costa Rica's most beautiful beaches near liberia. Liberia airport is located only 13 Km west of the center of Liberia and the nearest beach is about 20 minutes away. International flights to Liberia Costa Rica first began on December 1st, 2002. Since then its popularity as an alternative airport to San Jose’s busy Juan Santamaria International Airport (SJO) has increased steadily. This year alone up to 45 scheduled commercial flights to Liberia Costa Rica are expected every week. Liberia International and SJO, are approximately 234 Km (147 miles) apart; a 5 hour trip if road conditions are right. As you can see on this map Liberia is minutes away from some of Costa Rica's most popular beaches in the northwest region such as Flamingo beach, Tamarindo Beach, Coco Beach and the Bahia Salinas, home to the Dreams Las Mareas Hotel. If you are not sure which Airport to fly into. Have a look at our article on deciding between San Jose and Liberia Airports. Please note that there is a $29 US departure tax payable at the airport in US dollars or Costa Rican cash when you leave the country. A bus for the airport leaves from the northside of the main church at 5.30, 7.30, 8.30 and 9.30 AM and then at 1.30, 2.30, 3.30 and 5.30 PM. Airport shuttles and private airport transfers are by far the most popular and convenient way to get to your destination from the Liberia Airport. Our company has specialized in these private airport transfers since 2005. Our reliability and professionalism make us your top choice in service and value. Liberia Costa Rica Airport transportation, we can provide transport on many routes, including Liberia Airport to all hotels in Guanacaste and Costa Rica, Liberia Airport to Tamarindo Beach, Liberia Airport to Westin Playa Conchal, Liberia Airport to Dreams Las Mareas and other popular tourist destinations like Arenal and La Fortuna, Flamingo, Nosara/Guiones, Papagayo, Monteverde and Manuel Antonio. So we can also take you to your private home or condos anywhere in Guanacaste and Costa Rica. For more routes please see below. - Our vehicles are fully insured and comply with all safety regulations. - Maintenance is very important to us because it means safety and comfort for you. - We do our best to hire experienced drivers who know the roads you'll be traveling on and will get you to your destination in a timely but safely manner. Note: Under Costa Rica government law you need to book the transportation before your arrival to the liberia airport to get the service once you step outside the liberia airport. Airport shuttles and private airport transfers, will always bie met with a sign with your name on it. Airport shuttles go directly to your destination (hotel, vacation rental or private home) with no stops along the way unless you request one to your driver. An added benefit of the airport shuttle transportation is that it will go to areas and destinations where airport taxis and public buses usually do not go due to road conditions or route restrictions. Airport transfers can also accommodate excess or oversized luggage, provide car seats and carry pets upon request. We can provide transportation on many routes including Liberia Airport to Liberia Costa Rica Beach Hotels , Liberia Airport to Tamarindo, Liberia Airport to Hilton Papagayo and other popular tourist destinations such as Arenal, Monteverde and Manuel Antonio. Shuttle transportation is a cheaper alternative to a private transfer as it is a shared transportation. Shuttles pick up at specific times in the day, usually either once or twice daily. Rates are per person and if you are a larger group you will often be better off with a private transfer. For one or two people traveling a shuttle transfer will usually be your best option. Transportation To and From Liberia Airport are available From These Destinations. (click on a route to request a quote). Pick up points in Liberia for shuttle transfers are Best Western Las Espuelas, Liberia Costa Rica Airport Hotels. Travel times and distance from Liberia Costa Rica Airport,by shuttle and private airport transfers, are approximate times and depend on traffic and accidents. Travel time from Liberia Airport to Secrets Papagayo is approximately 30 minutes each way. Distance is 29 kilometers. Stops along the way for food, shopping or restroom breaks are available. For transfers to Liberia Airport plan to leave 2.5 hours before your scheduled departure time. Travel time from Liberia Airport to Andaz Papagayo Hyattis40 minutes each way. Distance is 35 kilometers. For transfers to Liberia Airport plan to leave 3 hours before your scheduled departure time. Travel time from Liberia Airport to Arenal is approximately 3.5 hours each way. Distance is 153 kilometers. Stops along the way for food, shopping or restroom breaks are available. For transfers to Liberia Airport plan to leave 5.5 hours before your scheduled departure. Travel time from Liberia Airport to Arenal is approximately 3.5-4 hours each way. Distance is 148 kilometers. Stops along the way for food, shopping or restroom breaks are available.For transfers to Liberia Airport plan to leave 5.5-6 hours before your scheduled departure. Travel time from Liberia Airport to Bahia Salinas is approximately 1.5 hours each way. Distance is 77 kilometers. Stops along the way for food, shopping or restroom breaks are available.For transfers to Liberia Airport plan to leave 3.5 hours before your scheduled departure time. Travel time from Liberia Airport to Barcelo Playa Langosta is 1.2 hours each way. Distance is 75 kilometers. Stops along the way for food, shopping or restroom breaks are available. For transfers to Liberia Airport plan to leave 3.5 hours before your scheduled departure time. Travel time from Liberia Airport to Barcelo Tambor is approximately 4 hours each way. Distance is 164 kilometers. Stops along the way for food, shopping or restroom breaks are available. For transfers to Liberia Airport plan to leave 7 hours before your scheduled departure time. Travel time from Liberia Airport to Borinquen Resort is approximately 1 hour each way. Distance is 43 kilometers. Stops along the way for food, shopping or restroom breaks are available. For transfers to Liberia Airport plan to leave 3 hours before your scheduled departure time. Travel time from Liberia Airport to Brasilito is approximately 1 hour each way. Distance is 70 kilometers. Stops along the way for food, shopping or restroom breaks are available. For transfers to Liberia Airport plan to leave 3 hours before your scheduled departure time. Travel time from Liberia Airport to Buena Vista Lodge is approximately 1 hour each way. Distance is 41 kilometers. Stops along the way for food, shopping or restroom breaks are available. For transfers to Liberia Airport plan to leave 3 hours before your scheduled departure time. Travel time from Liberia Airport to Cahuita is approximately 9.5 hours each way. Distance is 440 kilometers. Stops along the way for food, shopping or restroom breaks are available. For transfers to Liberia Airport plan to leave 24 hours before your scheduled departure time. Travel time from Liberia Airport to Playa Carrillo is approximately 2 hours each way. Distance is 112 kilometers. Stops along the way for food, shopping or restroom breaks are available.For transfers to Liberia Airport plan to leave 5 hours before your scheduled departure time. Travel time from Liberia Airport to Playa del Coco is approximately 45 minutes each way. Distance is 30 kilometers. Stops along the way for food, shopping or restroom breaks are available. For transfers to Liberia Airport plan to leave 2.45 hours before your scheduled departure time. Travel time from Liberia Airport to Dominical is approximately 7 hours each way. Distance is 303 kilometers. Stops along the way for food, shopping or restroom breaks are available. For transfers to Liberia Airport plan to leave 9 hours before your scheduled departure time. Travel time from Liberia Airport to Bahia Salinas is approximately 1.5-2. hours each way. Distance is 77 kilometers. Stops along the way for food, shopping or restroom breaks are available. For transfers to Liberia Airport plan to leave 3.5 hours before your scheduled departure time. Travel time from Liberia Airport to Occidental Grand Papagayo is approximately 30 minutes each way. Distance is 21 kilometers. Stops along the way for food, shopping or restroom breaks are available. For transfers to Liberia Airport plan to leave 2.5 hours before your scheduled departure time. Travel time from Liberia Airport to Exclusive Resorts is approximately 1 hour each way. Distance is 40 kilometers. Stops along the way for food, shopping or restroom breaks are available. For transfers to Liberia Airport plan to leave 3 hours before your scheduled departure time. Travel time from Liberia Airport to Flamingo is approximately 1.2 hours each way. Distance is 74 kilometers. Stops along the way for food, shopping or restroom breaks are available. For transfers to Liberia Airport plan to leave 3.2 hours before your scheduled departure time. Travel time from Liberia Airport to Four Seasons Resort is approximately 1 hour each way. Distance is 40 kilometers. Stops along the way for food, shopping or restroom breaks are available. For transfers to Liberia Airport plan to leave 3 hours before your scheduled departure time. Travel time from Liberia Airport to Occidental Grand Papagayo is approximately 30 minutes each way. Distance is 31 kilometers. Stops along the way for food, shopping or restroom breaks are available. For transfers to Liberia Airport plan to leave 2.5 hours before your scheduled departure time. Travel time from Liberia Airport to Hacienda Guachipelin is approximately 1 hour each way. Distance is 35 kilometers. Stops along the way for food, shopping or restroom breaks are available. For transfers to Liberia Airport plan to leave 3 hours before your scheduled departure time. Travel time from Liberia Airport to Hacienda Pinilla is approximately 1.5 hours each way. Distance is 80 kilometers. Stops along the way for food, shopping or restroom breaks are available. For transfers to Liberia Airport plan to leave 3.5 hours before your scheduled departure time. Travel time from Liberia Airport to Hilton Papagayo is approximately 30 minutes each way. Distance is 29 kilometers. Stops along the way for food, shopping or restroom breaks are available. For transfers to Liberia Airport plan to leave 2.5 hours before your scheduled departure time. Travel time from Liberia Airport to Jaco Beach is approximately 4 hours each way. Distance is 196 kilometers. Stops along the way for food, shopping or restroom breaks are available.For transfers to Liberia Airport plan to leave 6 hours before your scheduled departure time. Travel time from Liberia Airport to JW Marriott is approximately 1.5 hours each way. Distance is 80 kilometers. Stops along the way for food, shopping or restroom breaks are available.For transfers to Liberia Airport plan to leave 3.5 hours before your scheduled departure time. Travel time from Liberia Airport to La Fortuna is approximately 3 hours each way. Distance is 243 kilometers. Stops along the way for food, shopping or restroom breaks are available. Distance is 155 kilometers. Stops along the way for food, shopping or restroom breaks are available. For transfers to Liberia Airport plan to leave 5.5 hours before your scheduled departure time. Travel time from Liberia Airport to Liberia City is approximately 15 minutes each way. Distance is 13 kilometers..For transfers to Liberia Airport plan to leave 2.15 hours before your scheduled departure time. Travel time from Liberia Airport to Cahuita is approximately 7.5 hours each way. Distance is 379 kilometers. Stops along the way for food, shopping or restroom breaks are available.For transfers to Liberia Airport plan to leave 24 hours before your scheduled departure time. Travel time from Liberia Airport to Jaco Beach is approximately 4 hours each way. Distance is 190 kilometers. Stops along the way for food, shopping or restroom breaks are available. For transfers to Liberia Airport plan to leave 6 hours before your scheduled departure time. Travel time from Liberia Airport to Malpais is approximately 4.5 hours each way. Distance is 185 kilometers. Stops along the way for food, shopping or restroom breaks are available. For transfers to Liberia Airport plan to leave 7 hours before your scheduled departure time. Travel time from Liberia Airport to Manuel Antonio is approximately 5 hours each way. Distance is 270 kilometers. Stops along the way for food, shopping or restroom breaks are available. For transfers to Liberia Airport plan to leave 7.5 hours before your scheduled departure time. Travel time from Liberia Airport to Punta islita is approximately 3 hours each way. Distance is 132 kilometers. Stops along the way for food, shopping or restroom breaks are available. For transfers to Liberia Airport plan to leave 5.5 hours before your scheduled departure time. Travel time from Liberia Airport to Manuel Antonio is approximately 3 hours each way. Distance is 125 kilometers. Stops along the way for food, shopping or restroom breaks are available.For transfers to Liberia Airport plan to leave 6 hours before your scheduled departure time. Travel time from Liberia Airport to Montezuma is approximately 4.5 hours each way. Distance is 174 kilometers. Stops along the way for food, shopping or restroom breaks are available. For transfers to Liberia Airport plan to leave 7 hours before your scheduled departure time. Travel time from Liberia Airport to Nicaragua Border is approximately 1.5 hours each way. Distance is 90 kilometers. Stops along the way for food, shopping or restroom breaks are available.For transfers to Liberia Airport plan to leave 4 hours before your scheduled departure time. Travel time from Liberia Airport to Nosara is approximately 3 hours each way. Distance is 118 kilometers. Stops along the way for food, shopping or restroom breaks are available. For transfers to Liberia Airport plan to leave 5.5 hours before your scheduled departure time. Travel time from Liberia Airport to Ocotal is approximately 45 minutes each way. Distance is 32 kilometers. Stops along the way for food, shopping or restroom breaks are available. For transfers to Liberia Airport plan to leave 2.45 hours before your scheduled departure time. Travel time from Liberia Airport to Ocotal Beach Resort is approximately 45 minutes each way. Distance is 31 kilometers. Stops along the way for food, shopping or restroom breaks are available. For transfers to Liberia Airport plan to leave 2.45 hours before your scheduled departure time. Travel time from Liberia Airport to Peñas Blancas is approximately 1.5 hours each way. Distance is 90 kilometers. Stops along the way for food, shopping or restroom breaks are available. For transfers to Liberia Airport plan to leave 4 hours before your scheduled departure time. Travel time from Liberia Airport to Playa Avellanas is approximately 2 hours each way. Distance is 81 kilometers. Stops along the way for food, shopping or restroom breaks are available. For transfers to Liberia Airport plan to leave 4 hours before your scheduled departure time. Travel time from Liberia Airport to Playa Azul is approximately 2.45 hours each way. Distance is 95 kilometers. Stops along the way for food, shopping or restroom breaks are available. For transfers to Liberia Airport plan to leave 4.45 hours before your scheduled departure time. Travel time from Liberia Airport to Playa Grande is approximately 1.2 hours each way. Distance is 72 kilometers. Stops along the way for food, shopping or restroom breaks are available. For transfers to Liberia Airport plan to leave 3.2 hours before your scheduled departure time. Travel time from Liberia Airport to Playa Hermosa Guanacaste is approximately 30 minutes each way. Distance is 27 kilometers. Stops along the way for food, shopping or restroom breaks are available. For transfers to Liberia Airport plan to leave 2.5 hours before your scheduled departure time. Travel time from Liberia Airport to Hermosa Beach is approximately 4 hours each way. Distance is 204 kilometers. Stops along the way for food, shopping or restroom breaks are available. For transfers to Liberia Airport plan to leave 6 hours before your scheduled departure time. Travel time from Liberia Airport to Playa Langosta is approximately 1.2 hours each way. Distance is 75 kilometers. Stops along the way for food, shopping or restroom breaks are available. For transfers to Liberia Airport plan to l Transportationeave 3.5 hours before your scheduled departure time. Travel time from Liberia Airport to Borinquen Resort is approximately 1.5 hours each way. Distance is 76 kilometers. Stops along the way for food, shopping or restroom breaks are available. For transfers to Liberia Airport plan to leave 3.5 hours before your scheduled departure time. Travel time from Liberia Airport to Puerto Caldera is approximately 2.2 hours each way. Distance is 143 kilometers. Stops along the way for food, shopping or restroom breaks are available. For transfers to Liberia Airport plan to leave 5 hours before your. Travel time from Liberia Airport to Puerto Viejo de Limon is approximately 9.5 hours each way. Distance is 446 kilometers. Stops along the way for food, shopping or restroom breaks are available.For transfers to Liberia Airport plan to leave 24 hours before your scheduled departure time. Travel time from Liberia Airport to Puntarenas is approximately 2.2 hours each way. Distance is 145 kilometers. Stops along the way for food, shopping or restroom breaks are available. For transfers to Liberia Airport plan to leave 5 hours before your scheduled departure time. Travel time from Liberia Airport to Quepos is approximately 4.45 hours each way. Distance is 261 kilometers. Stops along the way for food, shopping or restroom breaks are available. For transfers to Liberia Airport plan to leave 7 hours before your scheduled departure time. Travel time from Liberia Airport to Rincon de la vieja is approximately 1.2 hours each way. Distance is 39 kilometers. Stops along the way for food, shopping or restroom breaks are available. For transfers to Liberia Airport plan to leave 3.2 hours before your scheduled departure time. Travel time from Liberia Airport to RIU Guanacaste is approximately 50 minutes each way. Distance is 35 kilometers. Stops along the way for food, shopping or restroom breaks are available. For transfers to Liberia Airport plan to leave 3 hours before your scheduled departure time. Travel time from Liberia Airport to RIU Palace is approximately 50 minutes each way. Distance is 35 kilometers. Stops along the way for food, shopping or restroom breaks are available.For transfers to Liberia Airport plan to leave 3 hours before your scheduled departure time. Travel time from Liberia Airport to Borinquen Resort is approximately 2 hours each way. Distance is 105 kilometers. Stops along the way for food, shopping or restroom breaks are available. For transfers to Liberia Airport plan to leave 4.5 hours before your scheduled departure time. Travel time from Liberia Airport to San jose is approximately 3.5/4 hours each way. Distance is 208 kilometers. Stops along the way for food, shopping or restroom breaks are available. For transfers to Liberia Airport plan to leave 6 hours before your scheduled departure time. Travel time from Liberia Airport to San Jose Downtown is approximately 4.5 hours each way. Distance is 220 kilometers. Stops along the way for food, shopping or restroom breaks are available. For transfers to Liberia Airport plan to leave 4.5 hours before your scheduled departure time. Travel time from Liberia Airport to Santa Teresa is approximately 4.5 hours each way. Distance is 180 kilometers. Stops along the way for food, shopping or restroom breaks are available. For transfers to Liberia Airport plan to leave 7 hours before your scheduled departure time. Travel time from Liberia Airport to Sugar Beach is approximately 2 hours each way. Distance is 81 kilometers. Stops along the way for food, shopping or restroom breaks are available. For transfers to Liberia Airport plan to leave 4 hours before your scheduled departure time. Travel time from Liberia Airport to Tamarindo is approximately 1 hour each way. Distance is 72 kilometers. Stops along the way for food, shopping or restroom breaks are available. For transfers to Liberia Airport plan to leave 3 hours before your scheduled departure time. Travel time from Liberia Airport to Westin Playa Conchal is approximately 1 hour each way. Distance is 65 kilometers. Stops along the way for food, shopping or restroom breaks are available.For transfers to Liberia Airport plan to leave 3 hours before your scheduled departure time. Travel time from Liberia Airport to Turrialba is approximately 6 hours each way. Distance is 285 kilometers. Stops along the way for food, shopping or restroom breaks are available. For transfers to Liberia Airport plan to leave 8.5hours before your scheduled departure time. Travel time from Liberia Airport to Villas del Sol is approximately 30 minutes each way. Distance is 27 kilometers. Stops along the way for food, shopping or restroom breaks are available. For transfers to Liberia Airport plan to leave 2.5 hours before your scheduled departure time. Liberia, Costa Rica is the gateway to some of the most priviliged beaches in Costa Rica's Pacific Northwest. Below you will find a selection of hotels and resorts on the Guanacaste 'Gold Coast' of Costa Rica. If you wish to know more about a particular beach please click on the beach links to find full descriptions of each location. For hotel information and reservations please follow the hotel's own link. Vacation at Allegro Papagayo and immerse yourself in this family friendly, all inclusive resort in one of the prime locations in Costa Rica. Just 45 minutes from Liberia Airport, this exotic beach resort will give you an unbeatable Costa Rican experience! Allegro Papagayo, in Playa Manzanillo is a world apart from all other resorts - perfect for Families, Weddings and Honeymoons Watersports are available & nightly entertainment provide more excitement and fun, making certain that your holiday is unforgettable. Kids Club activities give parents a real break. Considered one of the top dining experiences in Guanacaste, the Allegro Papagayo offers international a la carte dining, featuring both Mexican and Italian cusine. Or you may relax and sip a cocktail at the wet bar. Superior: Superior rooms: either king bed or 2 queens, as well as a balcony or terrace, mini-bar, Cable TV and hair dryer. Superior Bay View : Identical to Superior rooms, but with the additional bonus of spectacular ocean-views. Superior Bay View Premium: Similar to the other Superiors save that they are located closer to the pool and the beach. Los Corales:The main restaurant features buffet dining and offers a wide variety of international cuisine. This is an active sports bar in the evening, also featuring billiards. At 10:00 pm, the lights go down and the music and dancing begins. Late-night snacks are also served after 11 pm. Lobby Bar "El Mirador": Daily 10:00am - 5:00pm. This bar is open daily to enjoy a delicious cocktail with a beautiful bay side view. Snack Bar: Daily 11:00am - 5:00pm. Yet another option! Head to this bar for tasty snacks. Beach ClubEnjoy this snack bar lounge with its lounge chairs and sports activities just 15 minutes away by boat. You will enjoy the free roundtrip transportation to this pristine and private beach. Daily activities program by pool and beach area. Nightly entertainment with local talent with Fun Club. Aerobics, water polo, football, soccer, water basketball by Fun Club activities. Rates are per night on an all-inclusive basis. Children are between 3 and 11 years of age. Maximum capacity in a room: 3 adults and one child, or 2 adults and 2 children. During Christmas and Easter there is a minimum stay of 7 nights. The Grand Papagayo's unique setting and luxury amenities make it the perfect place for an unforgettable holiday. Just 35 minutes from Liberia Costa Rica Airport, you will find yourself immersed in luxury minutes after you land in Costa Rica. 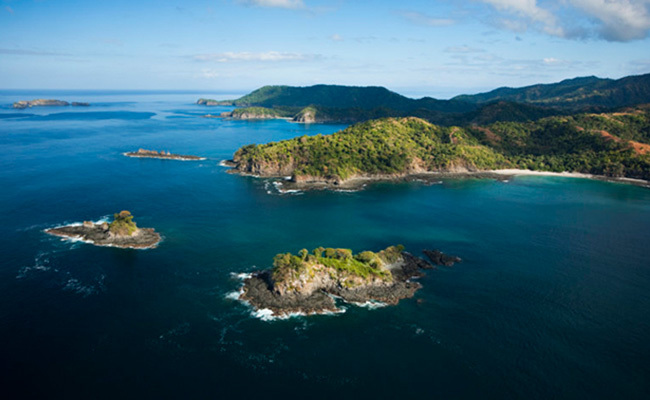 Guanacaste's unspoiled coastline, unique flora and fauna will enchant your memory for a lifetime. At the Occidental Grand Papagayo, you will find every indulgence that a luxury all-inclusive holiday should offer. Three dining options, each offering a unique experience, wait to tempt your tastebuds. A variety of accommodations, stylishly appointed, invite you to relax in the unforgettable setting of Costa Rica's Gold Coast. Absorb the breathtaking natural beauty of Costa Rica's Northern Pacific Coast, where lush tropical forests and volcanic cliffs descend into sand beaches and crystalline coves - home to parrots, monkeys and sea turtles. Couples, families, and friends alike will experience premium Costa Rican hospitality in this beautiful resort. Honeymooners will find themselves in paradise. At the Occidental Grand Papagayo, you will find a wide variety of tours available. Canopy tours, eco-excursions, world-class deep-sea fishing, snorkeling, scuba diving and a plethora of activities and sports await those who can tear themselves away from the relaxing luxury of the Resort. With all the amenities of a deluxe room but with the addition of beautiful ocean-views. Identical to Deluxe rooms. Additionally have Concierge service, Internet service café, Fruit basket, bottle of wine, turn down service, 10% discount spa treatment. Identical to Deluxe rooms. In addition come with a bottle of champagne, half hour massage in room per couple, first morning breakfast in bed, romantic dinner, turn down service, 10% discount spa treatment and a surprise gift. Giardini di Papagayo is an all inclusive resort set in the Bay of Culebra on Playa Panama in Papagayo. Rooms have amazing views of the ocean and the famously colourful Papagayo sunsets. Accommodations are divided amongst individual villas (with 4 rooms in each), thus providing a more intimate and private experience amidst the lush tropical gardens. Attention to detail is paramount at the Giardini di Papagayo Resort. Each villa is surrounded by tropical gardens that planted with local flora and fauna. The walkways are enhanced with artistic tile work. Local artisan statues decorate the walkways, as well as the gardens. Night lighting of the gardens and walkways adds emphasis to the incredible beauty of the flora and fauna while creating an tranquil ambience. Giardini di Papagayo is located on Playa Panama, in the Gulf of Papagayo, Guanacaste. The exotic resort is only 30 minutes away from the Liberia International Airport which is now receiving regular flights. Playa Panama is a five-minute drive from Playa Hermosa and ten minutes from Playas del Coco, a small beach town that has a number of bars, restaurants, stores and services. The capital of Guanacaste province is Liberia and it is about a half-hour drive away from Giardini and has additional bars, restaurants, stores and services. Giardini di Papagayo is ideally located at the northern end of Panama Beach making it a very private and secluded beach for swimming, tanning or simply exploring at your leisure. 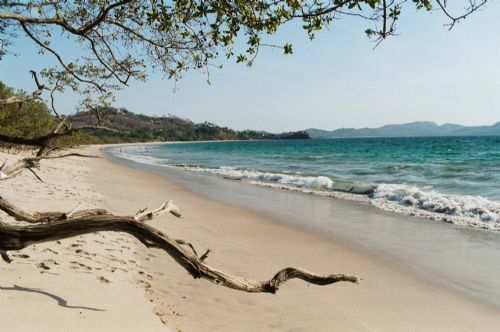 Playa Panama is arguably one of the most beautiful beaches in all of Guanacaste. It is over a mile long and about 50 yards wide at mid-tide. Playa Panama is a great swimming beach as the waves are small and there are no rip tides or dangerous currents. Playa Panama is a quiet and secluded beach area and most of the year it is essentially a private beach. Playa Panama offers Giardini guests a special place to go for a relaxing swim, to take romantic peaceful walks, or simply just to sit and watch the amazing sunsets. The beauty and tranquility of Playa Panama captivates guests and leaves them with unforgettable memories. The Pool area offers beach and ocean views as well as palm trees to provide shade and open areas for tanning on one of the many lounges. Giardini di Papagayo is made up of twenty individual villas that have been architecturally designed to offer four independent and private hotel rooms, thus offering guests more intimate and private accommodations. All suites are beautifully decorated and include floor to ceiling windows from which to take full advantage of the spectacular sunsets of Playa Panama. Special Features: private plunge pool, covered terrace, chez lounges, and a living room. Includes: air conditioning, ceiling fans, 2 double or 1 king size bed , pull-out sofa bed, small refrigerator, cable TV, direct dial telephone, pay safe, coffee maker, hair dryer, and unlimited hot water. Like the Suites each superior room has floor to ceiling windows from which to enjoy the sunsets. Special Features: a small terrace with a table and two chairs so our guests can fully enjoy the amazing ocean views and stunning sunsets. Includes: air conditioning, ceiling fans, 2 double or 1 king size bed , small refrigerator, cable TV, direct dial telephone, pay safe, hair dryer, and unlimited hot water. Standard rooms have no terrace or view. Includes: air conditioning, ceiling fans, 2 singles or 1 king size bed , small refrigerator, cable TV, direct dial telephone, pay safe, hair dryer, and unlimited hot water. 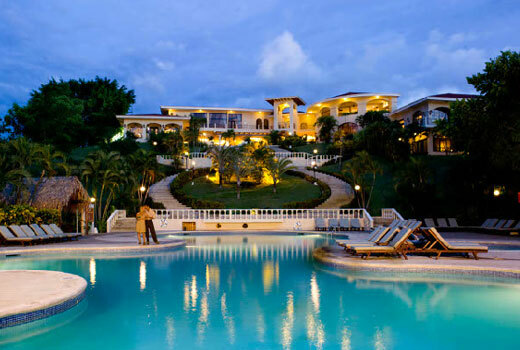 The all inclusive Hilton Papagayo Resort is situated in the spectacular Papagayo Gulf. Individual bungalows are arrayed on a steep hill which leads down to the calm waters of Culebra Bay and the small private sandy beach where guests may relax and truly unwind. The Hilton Papagayo Resort has a variety of bungalows set into the hill amidst local trees and plants. Each bungalow contains two rooms which are all appointed with air conditioning, ceiling fan, telephone, bathrooms with both bathtub and shower, hair dryer, color cable TV, safe deposit box, coffee maker and welcome mini bar. Program of activities by the pool; including aerobics, dance lessons, volleyball,, contests, jogging, biking and hiking. Non-motorised water sports. Eg; snorkeling and kayaking. Lounges and beach towel service. At the Premier Fiesta Resort you will find a variety of restaurants and eateries to suit every taste. Whenever you're feeling peckish you will find something to tempt you and all at no extra charge. Through 6 a.m. to 2 a.m. daily, at least one of the restaurants will be open. All restaurants feature smoking and non-smoking sections, fans or air conditioning. The main restaurant offers a wide selection of local and international dishes three times a day, buffet or “a la carte” style. In the evening, La Cosecha offers Theme Dinners, brought to you by expert chefs. Pamper yourself by making your dinner an unforgettable experience with international cuisine specialities at El Dorado restaurant. Enjoy the Chefs' finest culinary demonstrations, in an A/C, climate-controlled environment. Enjoy an exquisite Italian meal at La Tratoria, where you may dine on a variety of freshly prepared pastas, presented buffet-style. Before the Night Shows begin, you can enjoy Themed Dinners by the Amphitheater. Tasty snacks, refreshing drinks and cocktails at the snack bar, strategically located next to the main pool. Wind down at the pool with a Margarita, a Whiskey Sour, or any other cocktail of your choice at the only bar where having no shirt is actually required! 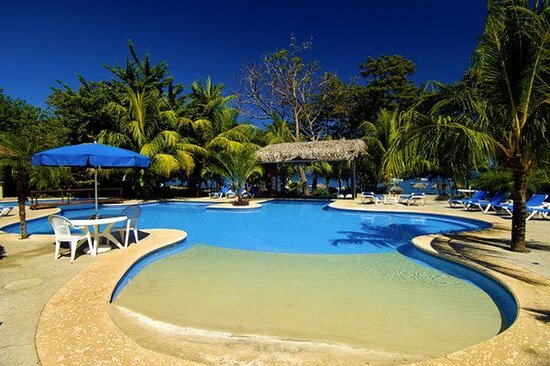 Nakuti Resort is an all inclusive resort located in Playa Panama, Papagayo just 35 minutes from Liberia Airport. The resort has direct access to the private and secluded beach of Playa Panama which is ideal for swimming, tanning and romantic sunset walks. Protected as it is by the Bay of Culebra, Playa Panama's sandy shores and tranquil waters make this an excellent choice for swimming, kayaking and snorkeling, as well as being ideal for young families. The free form pool is large with an abundance of lounges for tanning and palm trees to provide shade for those that prefer to limit their tanning but wish to enjoy the pool area. The pool is of a unique design, and is located just a short walk from the beach and offers beach and ocean views. The pool area also includes a whirlpool and a separate children's pool. The rooms and villas of Sol Papagayo are surrounded by exquisitely maintained lush green gardens with a small central pond as a centerpiece. The various rooms are interspersed among 7 small buildings and the remaining rooms are in the 19 individual villas. Space and privacy are the intrinsic features of this property, thus offering our guests more intimate and private accommodations. Standard Rooms:Air conditioning, ceiling fans, 2 singles or 1 king size bed , small refrigerator, cable TV, direct dial telephone, pay safe, hair dryer, hot water and terrace. Daily activities are promoted by an activities staff and include pool exercise classes, volley ball, beach walks, nature hikes and other activities. El Nakuti Resort is operated as an all inclusive hotel. Guests pay a single fee which includes their accommodation, meals, snacks non-alcoholic and alcoholic drinks. Alcoholic drinks are local brands. This beautiful resort is set overlooking one of the finest beaches in Costa Rica with panoramic views of the Papagayo Gulf. Whether you come here to unwind and relax or to keep your days filled with activity you will find the Ocotal Resort the perfect place in which to do it. With its friendly, attentive staff and stylish accommodations Ocotal Resort prides itself on offering you an excellent service so that you return home with some unforgettable memories. A variety of accommodations to suit various budgets. Beach Front Standard Rooms - located steps away from the sea. Panoramic View Standard Rooms - your own private balcony or terrace from where you may sip a cocktail as you watch the sun set over the Pacific in a blaze of colour. A jacuzzi and pool are situated close by. Bungalow Junior Suites - for those seeking more privacy these beautifully appointed duplex bungalows are set on a cliff top overlooking Ocotal Bay. Every 2 bungalows shares a pool overlooking the bay. The Ocotal Beach Resort offers delicious international cuisine in its 'Roca Bruja' (Witch's Rock) Restaurant. Enjoy your meal while gazing at the stunning view of the Pacific. Only three miles away is Playas del Coco, the local hub which has several restaurants, bars and souvenir shops if you would like to get out and about, as well as a pretty beach in its own right. True luxury accommodations, to North American standards, can be hard to find in Costa Rica. Bahia Pez Vela offers among the highest-quality accommodations in northern Guanacaste. The goal is to go above and beyond guests’ expectations; to meet this objective, the resort continually strives to improve facilities and services in its effort to turn your vacation dreams into reality. Bahia Pez Vela has its own private ebony-sand beach; forming a cove surrounded by imposing cliffs, the crescent-shaped beach is always the main focal point for anyone visiting the property. The sound of gentle waves lapping up onto the volcanic sand lulls you into a dreamlike trance. Situated at the crown of the visitors' mecca of Guanacaste, the resort is centrally located, close to several national parks, volcanoes, waterfalls, caves and stunning beaches. Nearby is the best diving in the country and, quite possibly, the best fishing as well. This peaceful, secluded vacation community seems worlds away from civilization, yet at the same time the conveniences of Playa del Coco and the Liberia International Airport, just 20 minutes away, are close at hand. Guests can feel completely safe here. 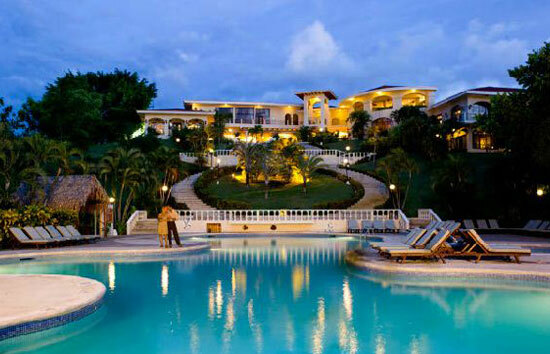 The private, guard-gated community is naturally secure; additionally there is 24-hour security. Set in a lush, tropical cove sheltering howler monkeys, parrots, toucans and a host of other wildlife, each villa boasts a spectacular view of the ocean, with fish jumping on the horizon and pelicans swooping for their breakfast. Costa Rica’s famous flora and fauna are just outside the door of your home away from home. Nestled in a secluded cove on a pristine private beach, Bahía Pez Vela is a seaside community of luxury vacation villas located in Playa Ocotal, near Playa del Coco in Guanacaste, Costa Rica. The location could not be better! Situated at the crown of the visitor’s mecca of Guanacaste, we are centrally located to several national parks, volcanoes, waterfalls, caves and beaches. This tropical paradise rests on the tranquil shores of Bahía Pez Vela – “Sailfish Bay” in English – known for its record-breaking billfish catches. What started out as an award-winning fishing camp has become a vacationer’s paradise, with facilities and activities to delight even the most discriminating traveler. There are 40 three-bedroom, two-story, luxury villas, all built to the highest North American standards, tastefully appointed and fully furnished with top-quality amenities. The poolside restaurant and bar is the perfect place for a casual meal or refreshing beverage with a fabulous view of the Pacific. Picante offers a tasty selection of both local and international cuisine, always served with a smile. And don’t miss the cool tropical concoctions – spectacular at sunset. During peak season and minimum stay of one week is required. Each villa can have a maximum occupancy of 8. 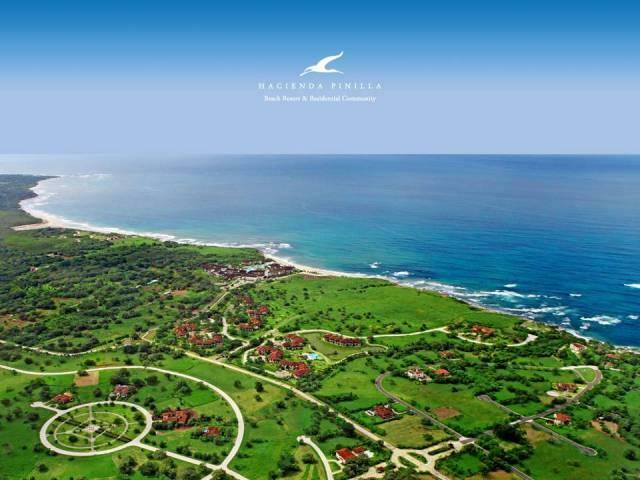 Villas Sol Hotel and Beach Resort is an all-inclusive resort located in the picturesque Playa Hermosa, Guanacaste. The Resort sits nestled on a hill overlooking the Pacific Ocean and surrounded by lush tropical gardens. Villas Sol is 4 hours from the San Jose Airport and just 40 minutes away from the Daniel Oduber International Airport in Liberia, Guanacaste. Playa Hermosa is an exotic gray sand beach with a calm and tranquil bay, perfect for swimming. 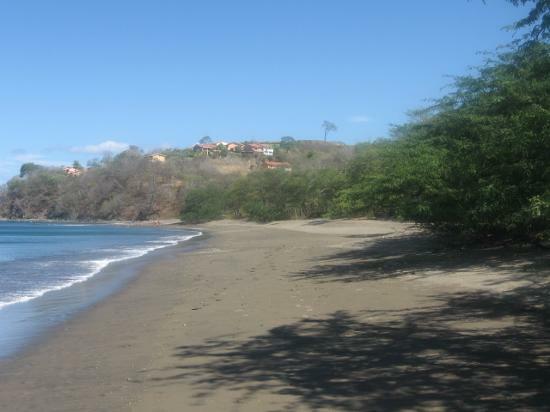 The beach received the “Blue Flag” award from the Costa Rican Institute of Tourism (ICT) for its cleanliness, quality, and the conservation of its natural resources by the local community. Playa Hermosa, Guanacaste is also one of Costa Rica’s best spots for skim boarding, diving, kite surfing, and snorkeling. The hotel provides a shuttle to the beach where you will find chaise lounges for the use of hotel guests. 54 deluxe hotel rooms nestled on a hill overlooking the Pacific Ocean and surrounded by graceful palm trees. Each room has a capacity for up to 4 persons (including children) and each has a unique ocean view. The Resort contains 106 villas nestled on a hill amidst lush tropical gardens. Some have a view of the bay. Many villas have their own private pool. This type of villa is specially thought for honeymooners and couples who want to have the comfort of a beach house and enjoy a gorgeous ocean view. This type of Villa has a capacity for up to 3 persons with one Queen Bed and a sofa bed. One Double bed in each bedroom, living & dinning room and kitchen. Comes with one double bed per room and two bathrooms. Some have a view of the Gulf and some have their own pool. Just one and a quarter hours from Liberia Airport, Hotel Ecoplaya Beach Resort is located in the furthest northern region of Costa Rica in an area of outstanding natural beauty under ecological protection. 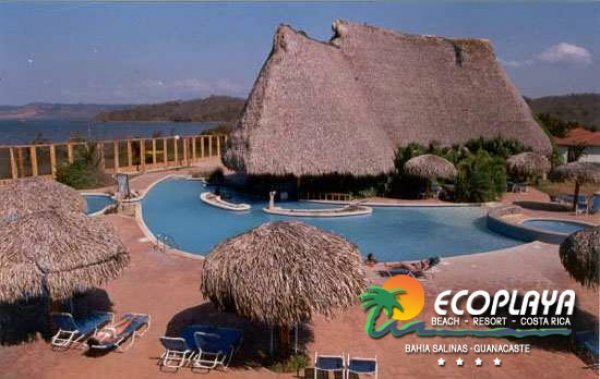 Set in the curve of Salinas Bay, the Ecoplaya Resort is lucky enough to be close to both the Santa Rosa Reserve, which has one of the last remnants of tropical dry forest, and Rincón de la Vieja National Park with its famous and active volcano. The Resort itself has access to its own half mile stretch of private beach as well as maintaining the lush vegetation of its own property. Amenities include pools and jacuzzi, wet bar and delicious local and international cuisine. The Resort offers two different rate plans. One is full board 'American Plan' and the other is on a room only basis. For reservations of more information please complete our online form. The Blue Dream Hotel is an excellent choice for a Costa Rica Vacation for those of you who love watersports and relaxing in a peaceful, uncrowded environment.Kite Surfing is a speciality, with the hotel playing host to the only kite surfing school in Central America, established since 2000.Blue Dream Hotel is located in Bahia Salinas (Salinas Bay) in the furthest north-west of Costa Rica in the province of Guanacaste.It is an area still unsullied by tourism with very little development. But despite this, it's only an hour away from Liberia, the capital of Guanacaste, with its International Airport, so it's very accessible. Blue Dream Hotel is situated just 250 meters from Playa Papaturro. From its vantage point you can take in the breathtaking views of Bahia Salinas as well as Isla Bolaños in the distance. The island is famous among birders as a nesting site for brown pelicans and frigatebirds. 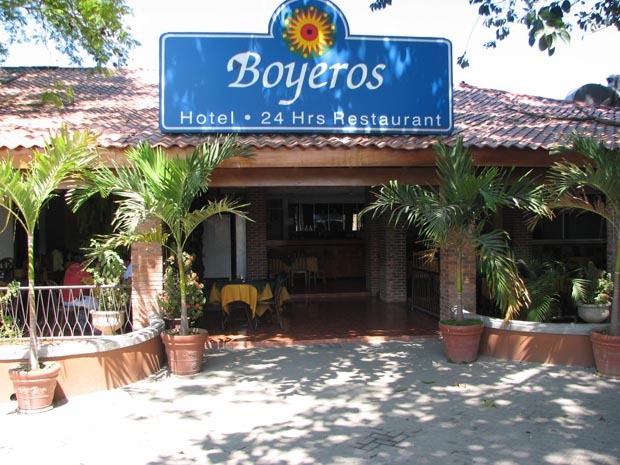 The restaurant serves typical Costa Rican food as well as Mediterranean-style dishes. The focus is on good service, cleanliness, healthy food and a good atmosphere! For breakfast - natural juices and a variety of nourishing food to start the day off with a good energy boost. For lunch - plenty of pastas and salads. For dinner - choose from a wide menu. And accompany your meal with some Italian wine, ice cream for dessert and expresso coffee.After dinner, you can chill out in the Sports Bar until closing. Watch videos, listen to music and chat with old and new friends. This location is probably the best in Costa Rica for water sports especially those dependent on off shore winds. 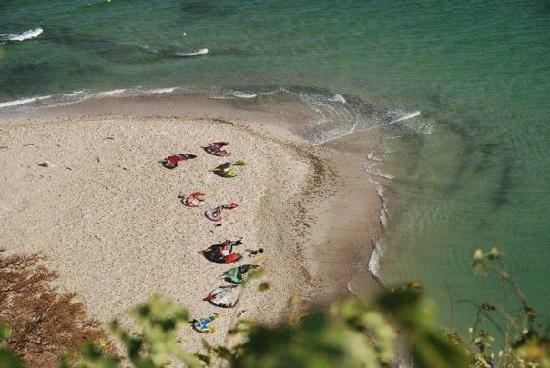 This is the place for Kite surfing and windsurfing. You can also enjoy wake boarding, sea kayaking, snorkeling, diving and sport fishing. Aside from water sports Mountain biking is an excellent option to explore the area. Special rates for groups and long term guests are available on request. Liberia Costa Rica Airport transportation, works 24/7/365 and depart as soon as you exit customs and immigration. Liberia Costa Rica Airport transportation goes directly to your destination (hotel, homes and condos) in Guanacaste and Costa Rica with no stops along the way unless you request one to your driver. An added benefit of the Liberia Costa rica Airport transportation is that it will go to areas and destination where airport taxis and public buses usually do not go for road conditions or route restrictions. Airport transfers and Airport Shuttles can also accommodate oversized luggage, provide car seats and carry pets upon request. LIBERIA, COSTA RICA is the capital of sunny Guanacaste province in northwest Costa Rica and gateway to some of the most beautiful beaches and National Parks of Costa Rica. Currently most travelers use Liberia as a base to visit areas. Travelers also frequently spend a night in the city before or after their flight to Liberia International Airport (LIR): Daniel Oduber Quiros International Airport. The best sights Costa Rica has to offer. The Arenal volcano is a highlight of Costa Rica. Though lava hasn’t been visible since 2010, it’s majestic cone shape is a sight to be seen (if the clouds aren’t covering it!). At the Arenal volcano area we will hike for about an hour with a naturalist guide at the Danaus Eco Center, a private reserve where we can observe animals such as sloths, butterflies, birds, caimans, exotic frogs like the red eyed tree frog ,the blue jeans dart frog, and many more. After a lovely lunch, we will move on to a beautiful area to enjoy hot springs at the foot of the volcano. Additional options – upon making your reservation with Costa Rica Northwest, feel free to swap the ecohike for a hanging bridges tour or other activity. Previous reservations required and additional costs may apply; please inquire with your reservation specialist. Prices: starting at $189 USD per person. Prices vary depending on your hotel/resort location. Remember: our tours are private tours just for your party! Explore Costa Rica's northwest country side in this one-of-a-kind ATV excursion. Travel through country roads, rivers and forests set away from the crowded tourist destinations and enjoy some of the best sights Costa Rica has to offer. Shuttle transfers leave Liberia Airport for ATV Day Adventure after each flight. 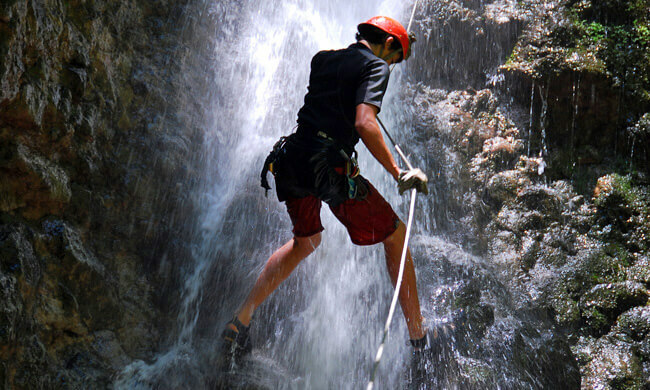 Carved over thousands of years the Colorado River Canyon offers a canopy adventure like no other in Costa Rica. Combined with the beauty of its tropical dry forest and crystal clear water this is without a doubt a tour to remember. Shuttle transfers leave Liberia Airport for Canyoning Adventure after each flight. Learn about the animals of Costa Rica as well as get a sense of adventure while floating in rafts down the beautiful Corobicí River, located about 45 minutes from the city of Liberia. The river is quite wide and has class I and II rapids with very moderate waves. Thus, this experience is great for all ages, safe enough for children and gentle enough for the older adults to enjoy. It’s great for nature lovers too: we hope to point out howler and white faced monkeys, coatis, iguanas and otters among other mammals or birds. Our journey begins in the gardens of the Corobici River, and lasts about 2 hours on the river. This tour is highly recommended for families or beginners that are more interested in nature. Prices: starting at $109 USD per person. Prices vary depending on your hotel/resort location. Want it all in one place in one day? This combo tour includes a zip line tour, one long waterslide (410 meters), horseback riding and a relaxing afternoon at a manicured garden dotted with natural-hot-springs-fed pools. Shuttle transfers leave Liberia Airport for Mega Combo Thrills after each flight. The unique Monteverde Cloud Forest Reserve will astound visitors with its biodiversity. Monteverde is home to more than 400 species of birds including the resplendent Quetzal, and three wattled bellbird, 120 species of amphibians and reptiles, 490 species of butterflies and 100 mammals (60 of which are bats!). You’ll also delve into a forest of orchids, bromeliads, ferns, vines and mosses. After your guided natural history walk at the Monteverde Reserve, have a cheese sample or delicious milk shake at Monteverde’s well renowned cheese factory. We’ll also visit an off-the-beaten-track working coffee farm in the nearby valley of San Luis. Don’t miss this colonial and cultural gem of a tour! You might not even believe how many activities we can pack into one day, to take full advantage of travelling to Nicaragua. Your early morning (dawn!) pickup is rewarded with a wonderful breakfast that will energize you for the 75-90 minute bus ride to the border. Your tour guide will guide you through the processes of the border crossing, some of which you complete on your own and some of which he will do for you. Then, first stop in Nicaragua: a leisurely drive along Lake Nicaragua with a stop at Catarina View point a dormant volcano where old time musicians play in the streets and a lovely breeze is in the air. Next, we next make a stop at the Masaya Market for lunch at an open air restaurant with live music. The adjacent Masaya market has a wealth of colorful, homemade arts and crafts, souvenirs and more. Enjoy! Our next stop is the active Masaya volcano which spews smoke and sulfur fumes (not for the faint of heart, pregnant, asthmatics…). After this volcano, we indulge you in the bright, colonial city of Granada. Take a 20 minute walk through the city observing the centuries’ old architecture. Our walk takes us to our boat dock where we then visit the jaw dropping Islas de Granada islands which speckle the lake and are topped with exotic and unique private homes. We end our journey here, board the bus and head back for the border. Prices: starting at $150 USD per person. Prices vary depending on your hotel/resort location. Reservations: Required ahead of time. Also, you will be required to provide your passport information to the person making your reservation including full name, nationality and date of expiry which has to be at least 6 months out. This is not a private tour; there will be others sharing this trip with you. Or, this tour can be private for an additional cost. Please inquire. Thank you! Palo Verde Nature by Water is a unique tour through forest in the wetlands of Northwest Costa Rica. The drive to Palo Verde is a part of the tour itself, passing through endless sugarcane plantations as well as cantaloupe and other crops which your guide can tell you about. At the Tempisque River, we climb into a simple but comfortable motorized boat and start looking for wildlife. Some of the birds we’ll look for are night and day herons, egrets, flycatchers, scarlet macaws, jacanas and others. We’ll also seek howler monkeys, capuchin monkeys, bats, iguanas, and other mammals. After a leisurely 2 hours, we’ll stop for an authentic woodstove Costa Rican lunch or dinner. Before heading back to your hotel, we’ll make a brief stop at an authentic home-based pottery studio. Prices: starting at $89 USD per person depending on your hotel/resort location. Imagine… adventure and relaxing all in one day! Join us on this unique combo on an enormous private property at the beautiful Rincon de la Vieja volcano countryside. 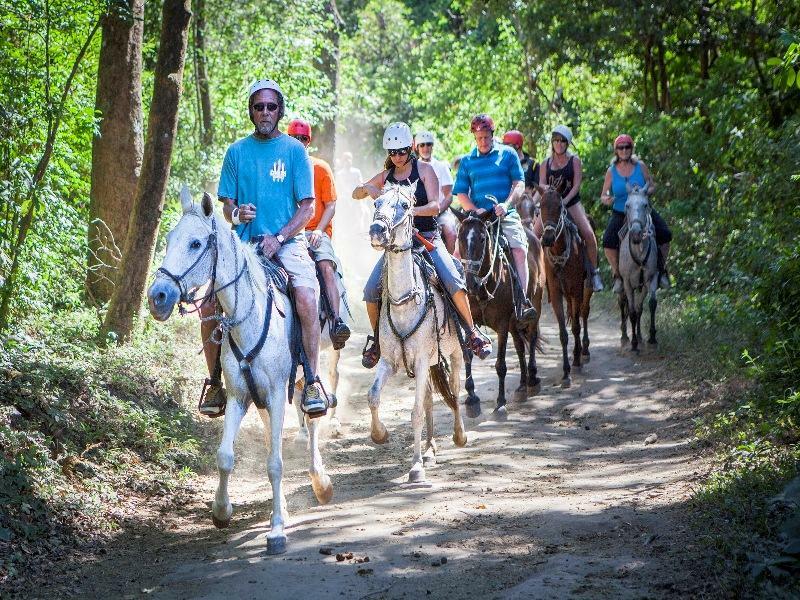 First, we’ll go on 35-40 minute horseback through beautiful scenery including amazing views of the Pacific coast and the Rincon de la Vieja volcano. This horse ride takes you to the start of the canopy tour where you’ll then be soaring through the treetops by ten zipline cables. All of this over beautiful forest and even passing by an amazing waterfall…what more could you ask for?! By the canopy tour’s end, you’ll be ready for lunch at the delicious Borinquen restaurant. The fresh typical Costa Rican meal boasts a variety of flavors from appetizers, beverage, main dish and dessert. After lunch, we move to the geothermal area where we can explore and enjoy fumaroles, a mud bath, a steam bath, hot springs as well as swimming pools. A much needed break after such adventure! Finally, we’ll head back to your hotel with an optional stop at a souvenir shop. Prices: starting at $149 USD per person. Prices vary depending on your hotel/resort location. Pacific Ocean sunsets are not to be missed! Experience a relaxing and unforgettable sunset sail under breathtaking colors while enjoying fresh and tasty snacks. The tour begins with an exciting sail to a secluded bay, and continues with snorkeling around beautiful reefs to discover the richness of Costa Rica’s marine life. Make sure your camera is ready! We hope to help you enjoy underwater life by finding dolphins, manta rays, and turtles. Prices: starting at $85 USD per person. Prices vary depending on your hotel/resort location. Remember: This is not a private tour; there will be others sharing this trip with you. Or, this tour can be private for an additional cost. Please inquire. Thank you! Prices: starting at $129 USD per person. Prices vary depending on your hotel/resort location. Payment information: Cash (USD) strongly preferred. Credit card option available upon request at least 24hr before. You can pay your tour guide on the day of your tour. Reservations: please reserve as much in advance as possible. 48hr notice or more preferred. Thank you! Cancellation: please, don’t! We offer the perk of not requiring prepayment, so we rely on your assurance that you are committed to your tour reservation. If you must cancel, please do so as early as possible (at least 48hr before your tour). Thank you for your understanding! If your destination is not listed or if you need additional transportation services please contact us for a quote. Private Transfers are just that! A large mini-van just for you and your family and friends that leaves at a time of your choice day or night. Stops and detours can be made according to your needs. Shuttle transportation is a cheaper alternative to a private transfer as it is shared with others. Shuttles pick up at specific times in the day, usually either once or twice daily and you may stop at several hotels in the pick up location as well as in the drop off location. Rates are per person and if you are a larger group you will often be better off with a private transfer. For one or two people traveling a shuttle transfer will usually be your best option. Still close to Liberia, but there is no bus here, you would need to take a taxi from del Coco. A flight to San José Costa Rica Airport will leave you just a short ride away from some of Costa Rica's most beautiful beaches, mountains and volcanos. San José airport is located 86 Km northeast of Jaco beach is about 1 hour and 30 minutes away. San José and Liberia International, are approximately 234 Km (147 miles) apart; a 5 hour trip if road conditions are right. As you can see on this map San José is minutes away from some of Costa Rica's most popular beaches in the southeast region such as Jaco Beach, Coco Beach, Dominical and Uvita for to whale and Watching Tour.